My sense of opinions about the market is that a majority seem to feel that the market is vulnerable to a decline because a lot of optimism about Trump's business-friendly policies has been priced in. That jibes with the fact that stocks are up about 10% since the day before the November election, but it doesn't square with the fact that real interest rates remain very low. 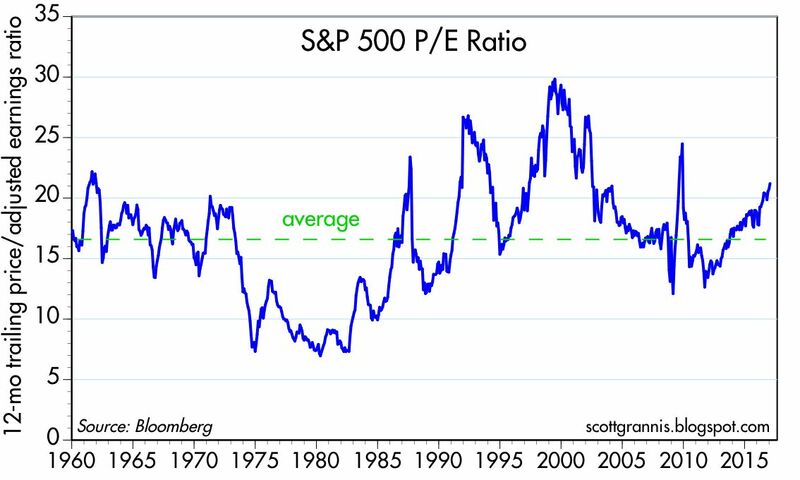 To be sure, PE ratios are above average, but relative to risk-free interest rates, the earnings yield on stocks is still elevated. A close look at real yields on TIPS tells us that the market does not expect the economy to do much better than the 2.1% annualized rate of growth it has registered since mid-2009. If the market were really pricing in optimism, real yields should be higher. So far, only nominal yields are up, and that suggests that inflation expectations are rising, not optimism. The chart above shows the PE ratio of the S&P 500, with the latest datapoint as of Friday: at 21.1, it is definitely above its long-term average of just under 17, so it's easy to look at this and conclude that the market is pricing in good news. But PE ratios can't be viewed in a vacuum. 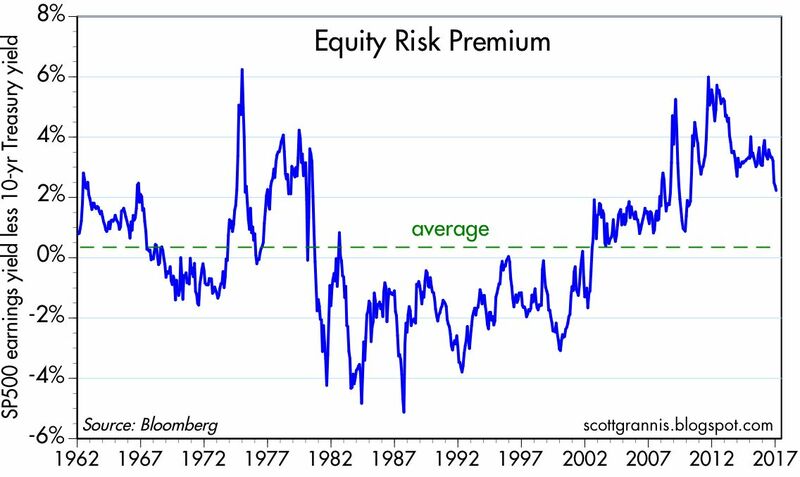 The chart above compares the earnings yield on stocks (EPS divided by price, or the inverse of PE ratios) with the yield on 10-yr Treasuries, which are a proxy for long-term risk-free rates. The greater the difference between these two, the less optimistic the market is. 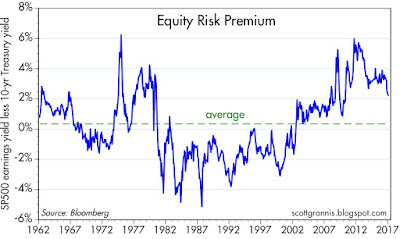 When the difference is negative, as it was in the 1980s and 1990s, the market is quite optimistic, since investors are willing to accept a very low yield on stocks relative to their risk-free alternative, because they are confident that stocks will appreciate by more than the difference. Today, it's almost the opposite; investors are unwilling to take on the risk of stock even though their yield is about 200 bps higher than the yield on 10-yr Treasuries. Fourth quarter GDP growth was weak, at 1.9%, and growth over the most recent four quarters was also weak, only 1.9%. 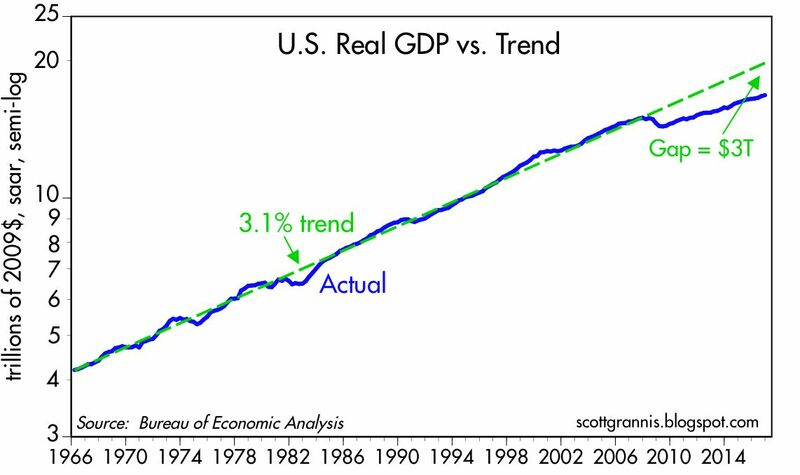 Looking back to the beginning of the current economic expansion, the annualized growth of real GDP has been a modest 2.1%, which is significantly below its long-term trend of about 3.1%. 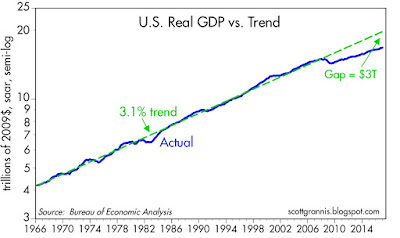 The chart above shows how significant this 1% annual shortfall in growth has been: the gap between where the economy is today and where it could have been if growth had been 1% per year stronger, is about $3 trillion. If this had been a normal recovery, real incomes on average would be about 15-17% higher today than they actually are. No wonder this has been a disappointing economy, even though it has been growing rather steadily for over seven years. 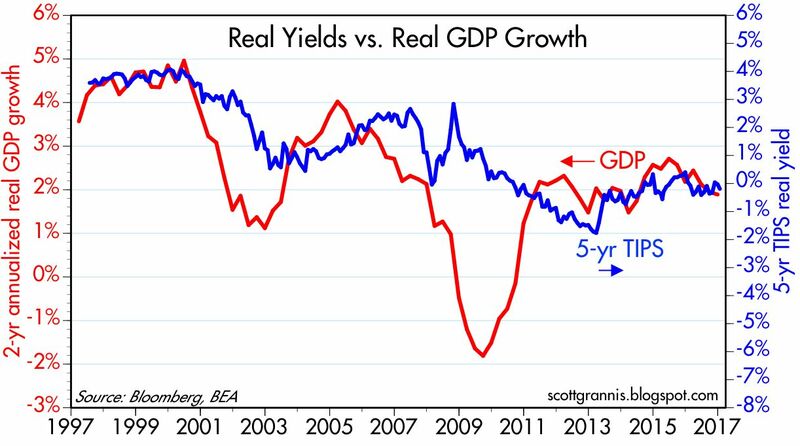 The chart above compares the real yield on 5-yr TIPS to the 2-yr annualized growth rate of real GDP. It's likely not a coincidence that real yields on TIPS have been zero to negative for a number of years, while the economy has managed real growth of only 2%. 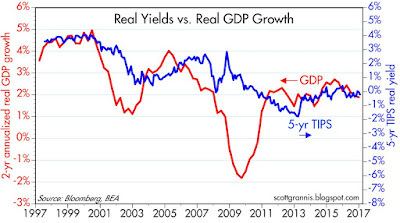 Think of the real yield on 5-yr TIPS as the risk-free real growth rate that investors can lock in; it should rarely be equal to or higher than the real growth of the economy (which is best proxied, I would argue by the 2-yr annualized growth of GDP), because if it were, then TIPS would be the best risk-adjusted investment in town. Typically, as the above chart also shows, the real yield on TIPS tends to be somewhat less than the prevailing real growth rate of the US economy. That is as it should be: risk-free real yields should normally be lower than the real returns available from a growing economy, because the latter are uncertain. 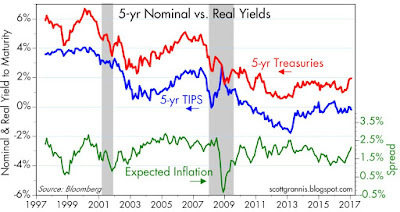 When the economy was growing 4-5% per year in the late 1990s, real TIPS yields were 3-4%. 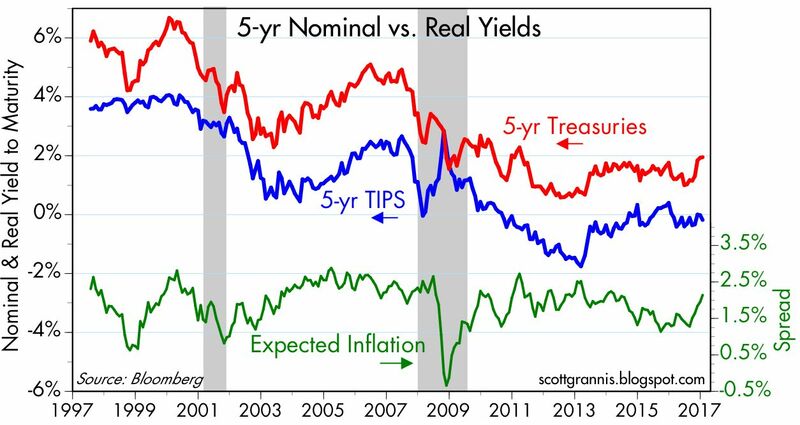 Now that the economy is growing 2%, real TIPS yields have rarely been higher than 0.5%. Real yields on 5-yr TIPS are going to have to rise meaningfully before it can be said that the market has turned optimistic about the future of the US economy. What has the economy been so sluggish for so long? The chart above is one answer: business investment has been unusually weak. Without investment it's very difficult to grow. Without investment in new plant and equipment, new software, etc., worker productivity is likely to be low. And indeed, productivity has been a meager 0.5% or so per year, on average, for the past 5-7 years. 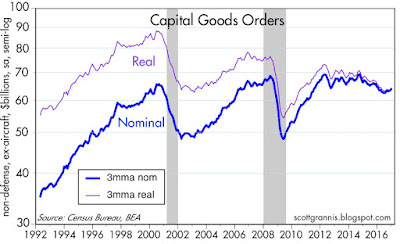 The chart above tells the same story: capital goods orders, a proxy for business investment, have been very weak. In real terms, they haven't growth at all since the mid-1990s. The chart above compares the real and nominal yield on 5-yr Treasuries, and the difference between the two (green line), which is the market's expected rate of CPI inflation over the next 5 years. Note how nominal yields have jumped in the past few months while real yields have been relatively flat. All that's happened, as far as the bond market is concerned, is that inflation expectations have risen from 1.3% last summer to now just over 2.1%, and most of that rise can be explained by higher oil prices. Higher inflation expectations could arguably be a healthy development, if only because the market seems to have lost its fear of deflation. But if inflation expectations were to continue to rise, that would soon become problematic, since it would mean that the Fed was falling behind the inflation curve, and sharply higher interest rates would soon become inevitable. 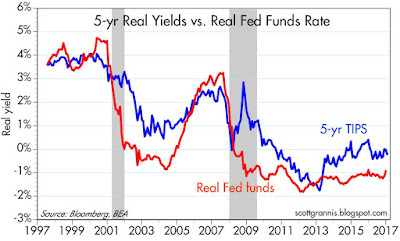 UPDATE: The chart below compares the real Fed funds rate to the real yield on 5-yr TIPS. The real funds rate is today's real risk-free rate, while the 5-yr real yield on TIPS can be thought of as what the market expects the real funds rate will be in 5 years. The blue line is usually above the red line, which is the normal state of affairs because it means the market expects the Fed to "tighten" in the future. 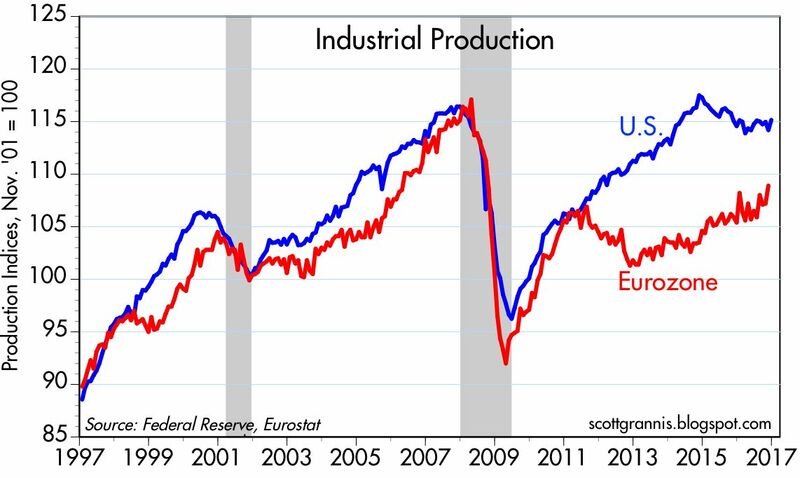 But when the red line exceeds the blue line, it means the market senses the economy is weak and will require Fed easing in the future. Note that the red line exceeded the blue line in advance of the past two recessions; this is just another way of saying that tight Fed policy plus an inverted real or nominal yield curve is a good warning sign that a recession may be on the horizon. The market won't be "optimistic" about the future of the economy unless and until the 5-yr real yield on 5-yr TIPS moves significantly higher. Because that will be the best indication that the market senses the economy is going to improve significantly and that the Fed will therefore be accelerating its rate hikes. Underscoring once again Trump's massive ignorance regarding how international trade and capital flows work, his administration is now floating the idea of imposing a 20% tax on Mexican imports as a way to pay for building a wall along the US-Mexico border. This of course would penalize Mexico to a degree, since it would make Mexican goods more expensive to US consumers and thus would likely reduce to some degree the amount of Mexican goods that US consumers purchase. But whatever tax is eventually collected on Mexican imports would unquestionably be paid 100% by US consumers. This is just plain stupid, like cutting off your nose to spite your face. Most of the things Trump has done in his first few days have been impressive: e.g., mostly good people appointed to key positions, decisive moves to roll back some of Obama's more egregious regulations. But his approach to trade remains abysmally wrong-headed and potentially threatening. 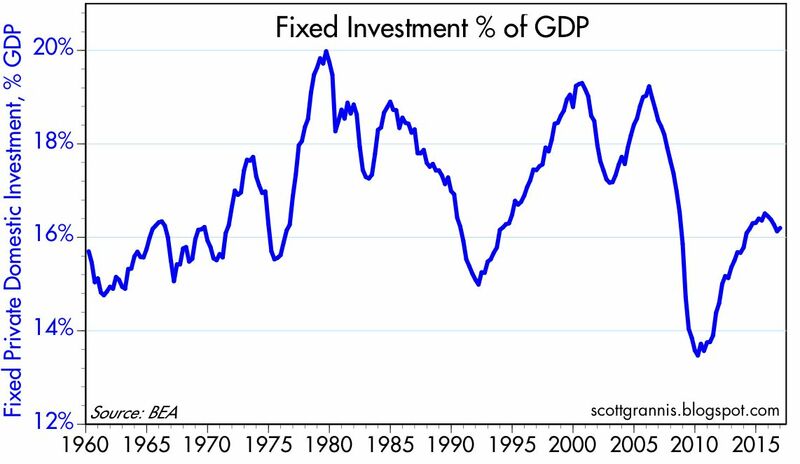 Any decent student of international trade and capital flows knows that there is nothing per se wrong with a deficit in commercial trade, since it is automatically offset by a surplus in capital flows, much of which could be investment-related. This is particularly true in the case of the US, since the dollar is free-floating: imbalances in trade and capital flows, if they exist, must inevitably show up in a compensating manner in the exchange rate. In the past year or so, the dollar has been stable to stronger, and that suggests that more people want to buy dollars than sell them. Since our trade deficit persists, it is logical to assume that foreigners are apparently more eager to buy dollars for investment purposes, than to buy dollars for the purpose of purchasing our goods. What's wrong with having foreigners anxious to invest in US assets? Instead of marching to protest all the things that the left imagines Trump will do to trample civil rights and denigrate women—none of which has yet to happen—everyone should be marching to protest his professed desire to make life more expensive for US consumers. If the MSM can't figure this out, they deserve to go out of business. UPDATE: Don Boudreaux says the same thing, perhaps in a more concise way. Recent inflation data suggest there is little risk of inflation coming up short of the Fed's 2% goal. 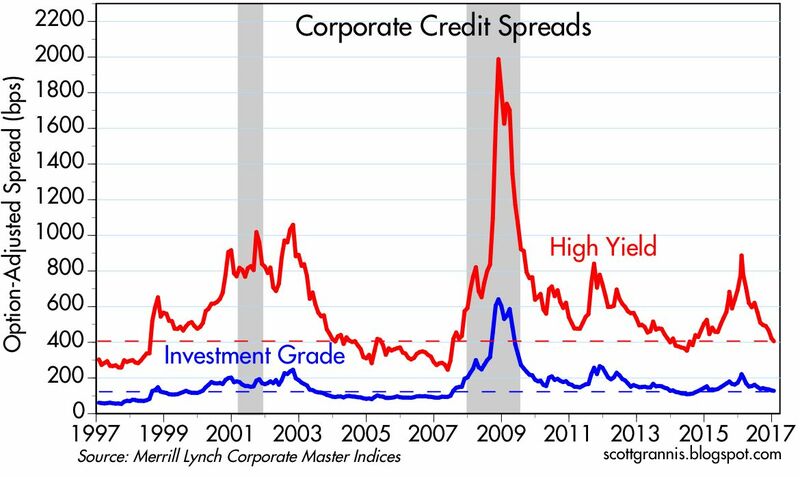 Meanwhile, implied equity volatility is near the low end of its historical range, and credit spreads are also near their lows. If Trump's economic policies (e.g., reduced tax and regulatory burdens) are successfully implemented, then we're likely to see even more signs of growth and, in turn, higher inflation—which implies that the Fed will need to adopt a more proactive tightening agenda. In the current environment, the "price" of stronger growth will inevitably come in the form of higher-than-expected interest rates. The December CPI reading showed prices up 2.1% over the past year—the highest reading since oil prices started to plunge beginning in mid-2014. 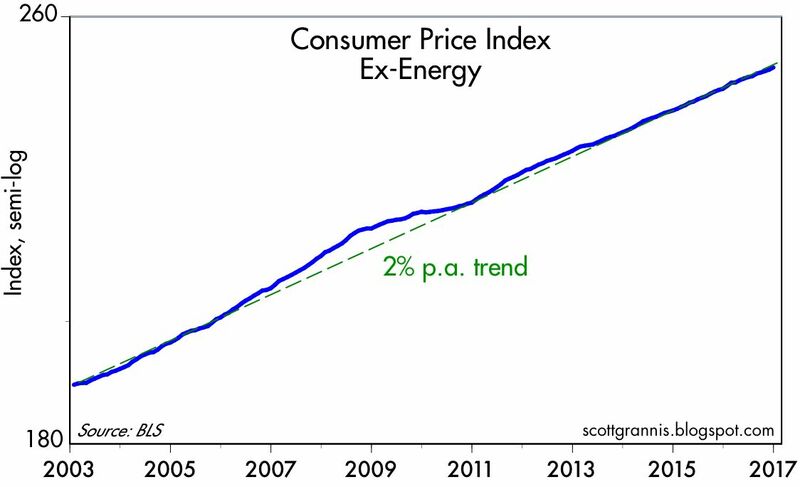 Abstracting from oil, as the chart above shows, the CPI has been running very close to 2% per year on average for the past 14 years. 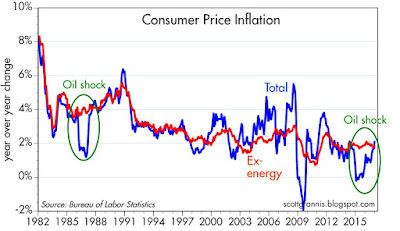 What happened with oil and the CPI in the past few years was remarkably similar to what happened in the mid- to late 1980s, when oil prices also collapsed and headline inflation followed suit. 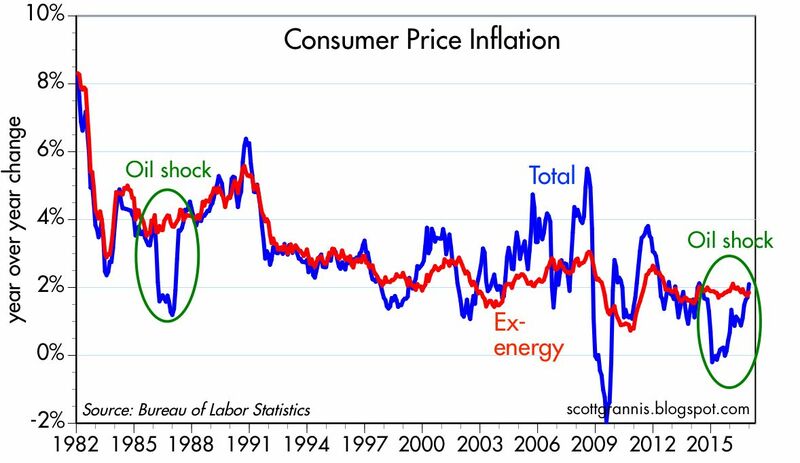 Once oil prices stopped declining, as they eventually did both times, then headline inflation jumped back up to where it was before the oil price shock, as the chart above shows. To the extent that the world has been worried about inflation being "too low" in recent years, it was a mistake. Inflation has been alive and well all along. 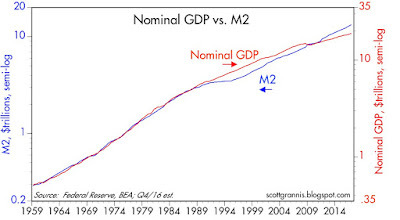 The chart above is remarkable, because it shows that there has been a very close relationship between nominal GDP and the M2 measure of money supply for many decades. This is why economists tend to prefer M2 above other measures of inflation: it's demonstrated a fairly predictable relationship to nominal GDP over long periods. But what is also apparent in the chart is the divergences of these two dissimilar variables over the past few decades. M2 "undershot" nominal GDP in the 1990s, and it "overshot" nominal GDP in the 2010s. Currently it looks like there is about $2 trillion of "extra" money sloshing around the U.S. economy. This is money that has for the most part been stockpiled in bank savings deposits which pay very little interest and which have more than doubled in the past 8 years (to almost $9 trillion currently). 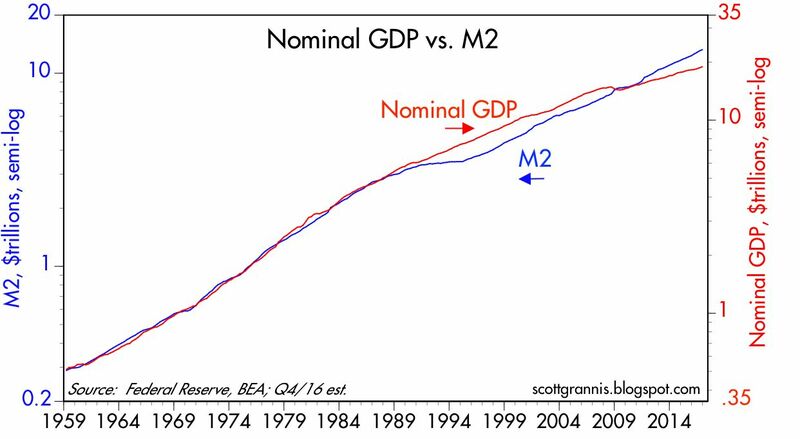 As the chart above shows, M2 is now about 70% of nominal GDP, whereas for over three decades it tended to average about 57% of nominal GDP. The pronounced rise in the ratio of M2 to GDP is symptomatic of a general increase in the world's demand for dollar cash and cash equivalents. (M2 is comprised of currency, retail checking accounts, time deposits, retail money market funds, and bank savings deposits.) 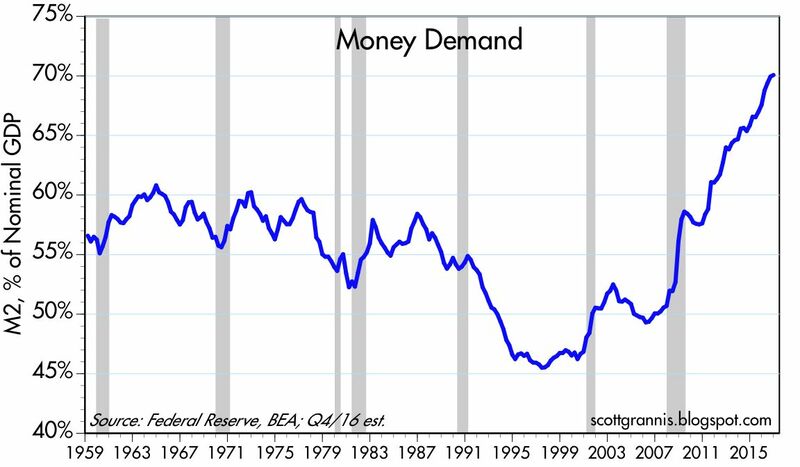 Not coincidentally, the dramatic rise in the demand for money has coincided with a pronounced increase in risk aversion, as I've been noting repeatedly over the years. 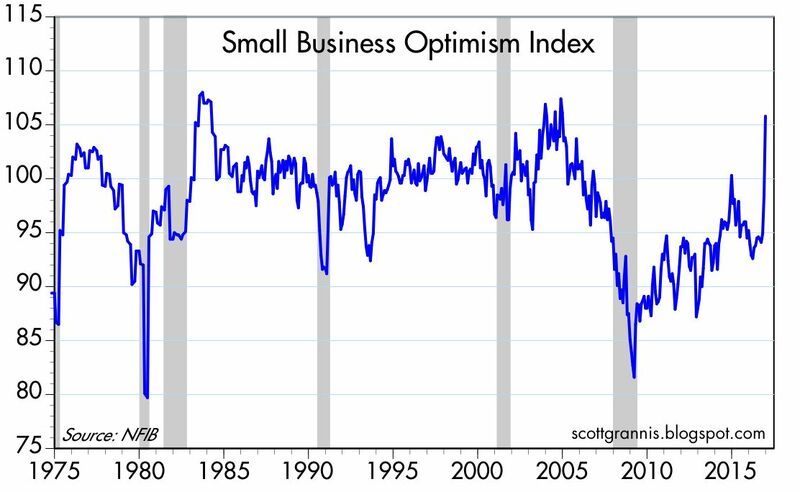 But as I noted last week, small business optimism has improved rather dramatically of late, and consumer confidence is on the rise as well. And of course the stock market has hit new highs. Optimism is making a comeback, and that in turn suggests that the world's demand for money is not going to continue to rise, and is more likely to begin to fall. If the demand for money does begin to fall, then the rate of M2 growth is likely to slow and/or the rate of nominal GDP growth is likely to pick up. 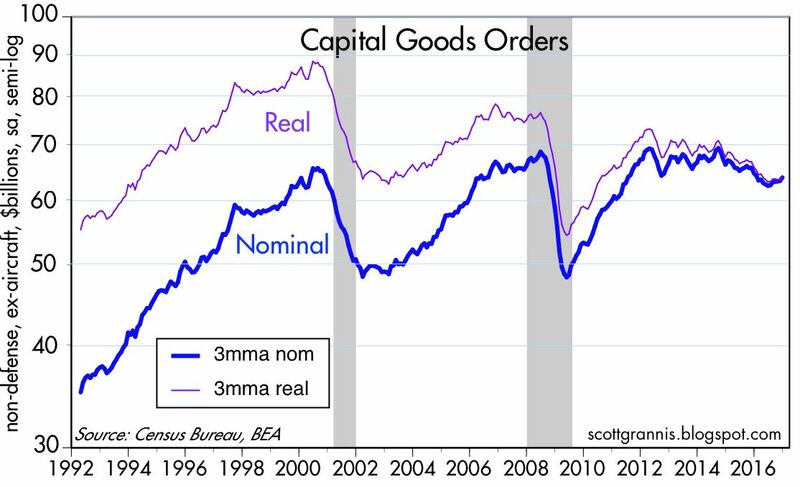 Faster nominal GDP growth would likely include some pickup in both real growth and inflation. 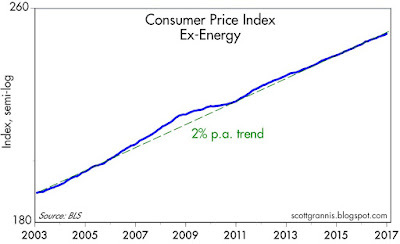 With inflation already running at 2% or so, any inflation pickup could—over the next year or so—begin to flash warnings signs that the Fed is falling behind the inflation curve. 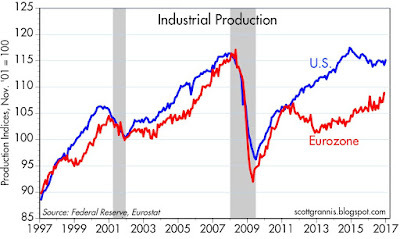 In the meantime, it's worthwhile noting that U.S. industrial production has picked up a tad over the past year, likely due to the consolidation of the oil market, and that Eurozone industrial production growth is outpacing that of the U.S. We are very likely in the midst of a coordinated increase in economic activity worldwide, even though it is still in its infancy. 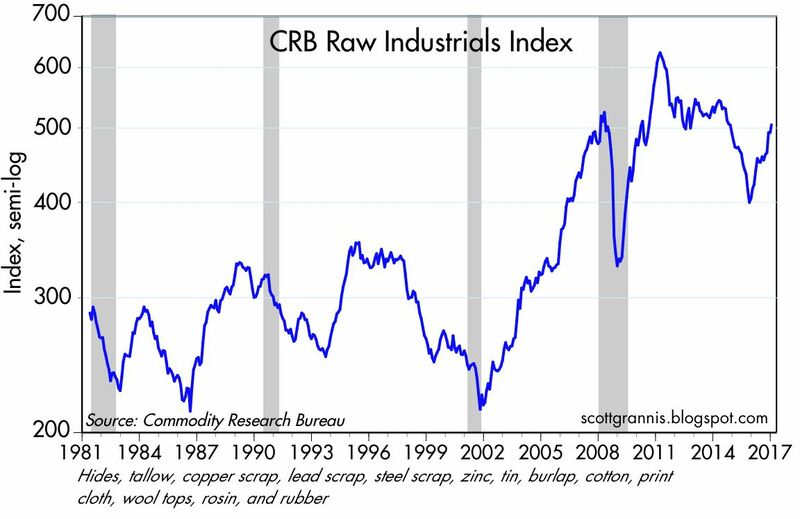 Industrial commodity prices have risen more than 25% in the past year, providing decent confirmation that economic activity is indeed picking up. As the chart above shows, it's rather unusual for commodity prices to be picking up by so much at a time when the dollar has been unusually strong. 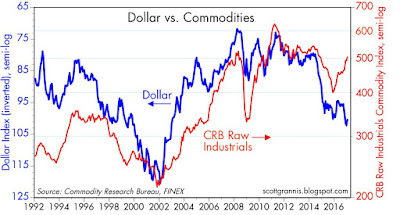 Usually commodity prices and the dollar move in opposite directions (note that the chart uses the inverse of the dollar index). 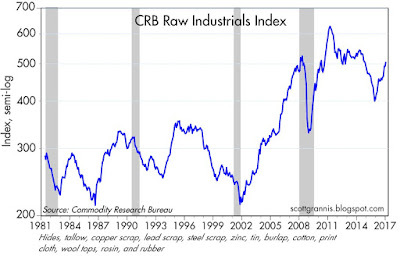 One explanation for the fact that commodity prices and the dollar are moving up together is that the world has been surprised at how resilient economic activity in both the U.S. and the world economy has been (recall that everyone has been very pessimistic for years). Markets move when things turn out to be different than expected. 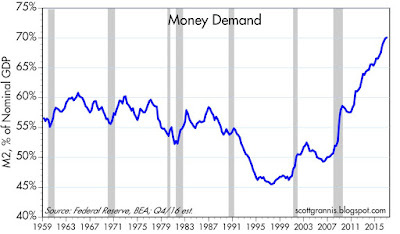 Demand for dollars (as distinct from demand for dollar cash, I should note) has been strong because the U.S. economy and its prospects look better today than people thought they would. Commodity prices are up because producers underestimated global demand for commodities. 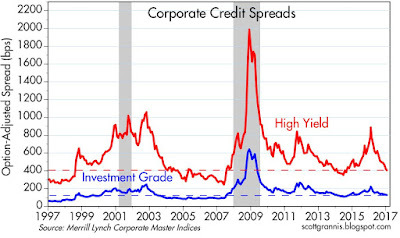 Circling back to measures of confidence, the chart above shows that corporate credit spreads are nearing historically low levels. This suggests that the economic outlook is improving, corporate balance sheets are healthy, and the market's appetite for risk has improved. 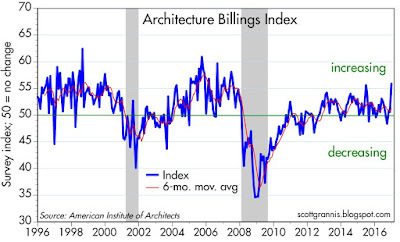 Confidence is clearly up, and economic activity is likely firming. The next shoe to drop should be a decline in the demand for money. That in turn should show up in the form of stronger real growth as well as a pickup in inflation. Assuming all that happens, the Fed will need to respond with higher-than-expected interest rates, and today Janet Yellen hinted as much, although only gently. President Barack Obama has made one final contribution to the fight against global warming on his way out the White House door. On Tuesday, Obama transferred $500 million to the UN's Green Climate Fund, a key program set up to finance climate change adaptation and renewable energy projects in developing countries. That's on top of another $500 million the Obama administration had already given to the fund. There are undoubtedly hundreds, if not thousands, of such examples of a politician spending other people's money for causes that he or she deems worthy. But I would feel a lot more comfortable if people were given the choice when it comes to "worthy causes." Government should never be in the business of providing charity, because charity is an activity which is best left to the private sector. First, let people keep more of the money they earn. Then let them decide which worthy causes they would like to finance with their private and voluntary contributions. If "worthy causes" fail to raise the money they need, then those same causes might want to rethink how worthy they really are. Evidence continues to support my observation last month that animal spirits are picking up. 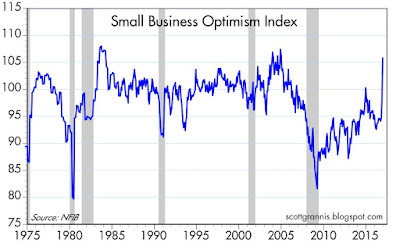 The chart above shows the latest (December) Small Business Optimism Index, which has virtually exploded following the November election. Small businesses, who employ 48% (57 million) of all private sector employees, are apparently feeling MUCH better about the future, presumably because they believe that President-elect Trump will be good for business. Regulatory and tax relief such as Trump promises would almost certainly result in more investment, more jobs, and more growth. 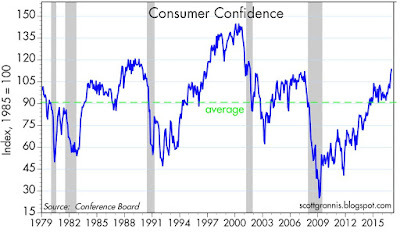 As the chart above shows, consumers are also feeling better these days. 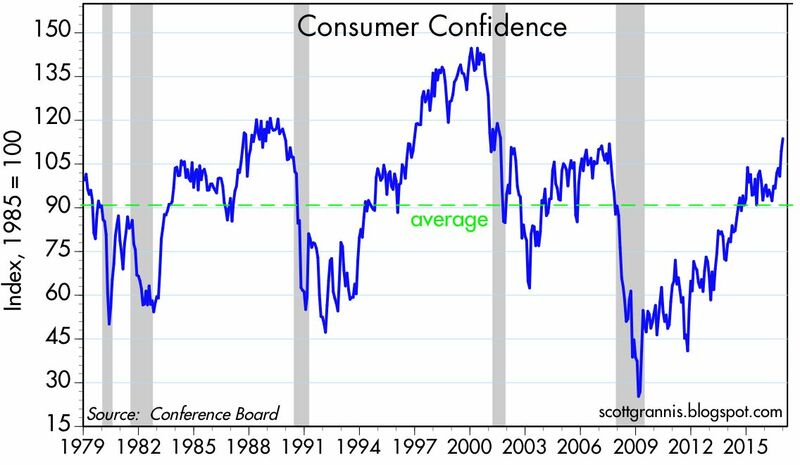 According to the Conference Board, consumers are more confident today than at any time since the current recovery started. 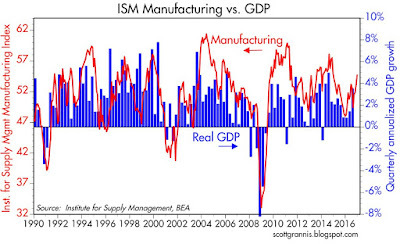 A stronger-than-expected ISM manufacturing report helped get the stock market off to a good start for the year. 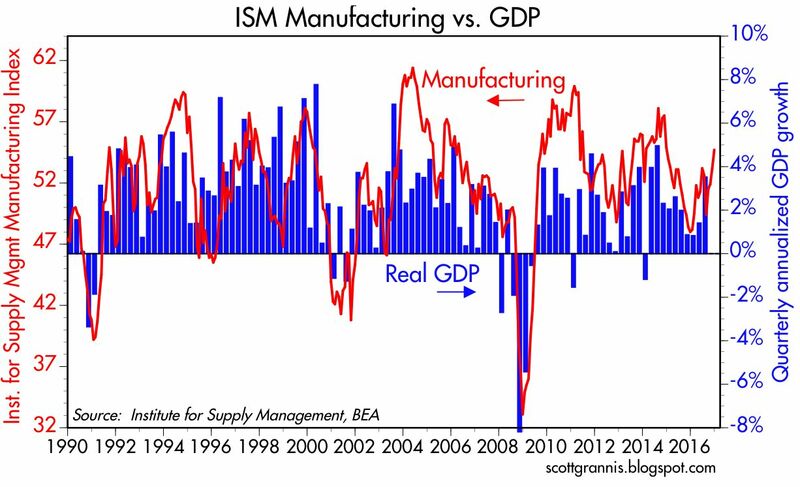 As the chart above shows, the ISM manufacturing index is pretty representative of strength in the broader economy. Today's December ISM report is consistent with fourth quarter GDP growth of 3-4%, and that is somewhat better than the market had been expecting. The Atlanta Fed's GDPNow forecast for the fourth quarter had been 2.5%, and today it rose to 2.9%. 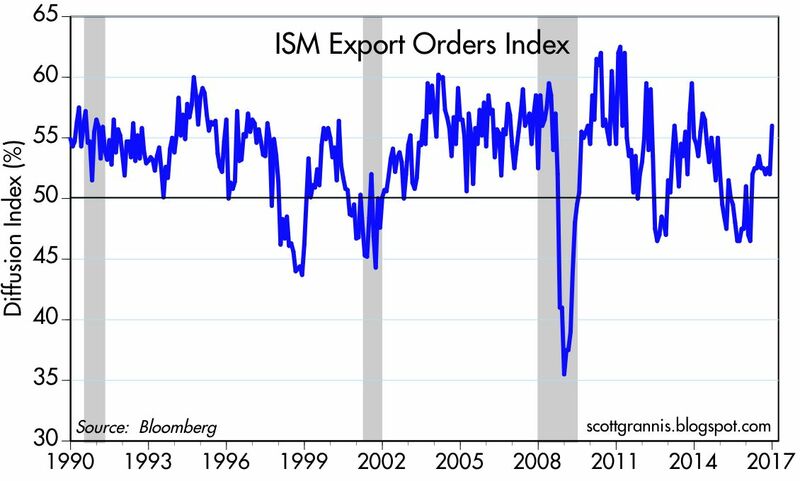 Export orders, shown in the chart above, were usually strong in December, a good sign that overseas economic activity is picking up. 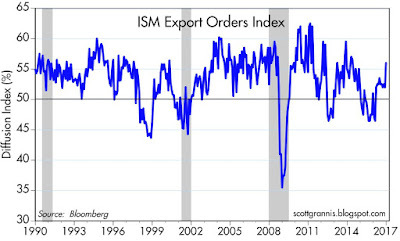 It's also encouraging that export orders have strengthened even as the dollar has strengthened (normally a stronger dollar would be expected to make life more difficult for U.S. exporters). 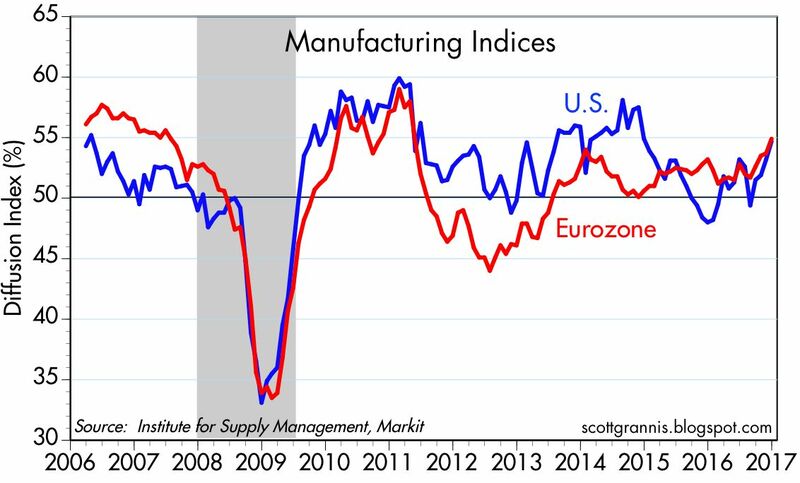 This further suggests that animal spirits are rising both here and abroad. 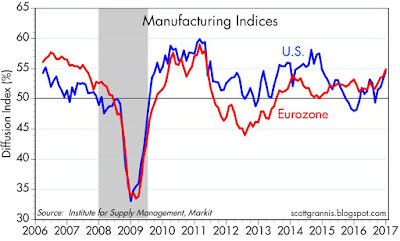 The chart above provides confirmation of this, in that it shows that manufacturing conditions in both the U.S. and the Eurozone have improved quite a bit in recent months. A synchronized strengthening of economic conditions around the world is a very welcome development.